The Iranians are very good at snacking. And this is nowhere better demonstrated than by their serious picnic habit. They LOVE to picnic, and come the Spring you will see rugs and makeshift barbecues and cooking pots all over the parks and countryside. Most importantly, thirteen days after NowRooz – the Persian New Year – it is considered very bad luck to stay indoors, and the whole nation and his neighbour empties out to celebrate, throw away their sabzeh (wheatgrass, grown just for the new year) and release their goldfish (kept as a symbol of prosperity for NowRooz). Ex-pat Iranians are less successful in observing this festival – which is known as sizdahbedar (the thirteenth out of doors) – on account of the fact that the British Spring is less, um, reliable, and the authorities are wary of their (BBQ) fire-starting habits. This year Sizdahbedar falls on Wednesday 2nd April – so if you see any Iranians picnicking, give them a cheery wave. 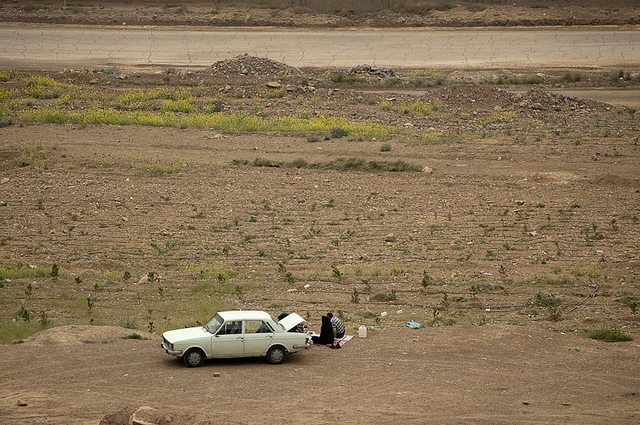 This cracking shot of an Iranian couple picnicking in the middle of nowhere was sourced from Flickr under the Creative Commons Licence for Commercial Use and was snapped by Kamyar Adl. This entry was posted in Postcards from Snackistan and tagged Iranian picnic, sizdarbedar on March 30, 2014 by Sally Butcher.